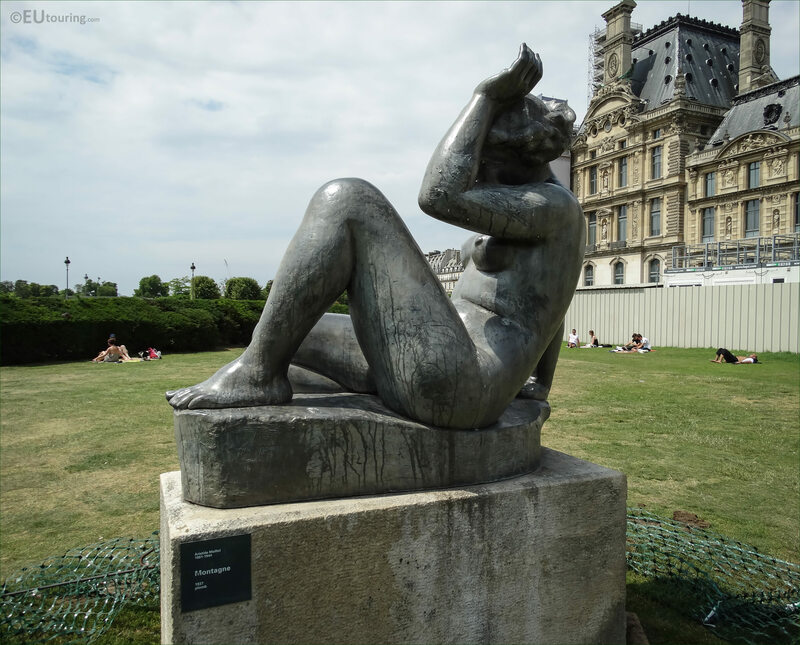 We were again within the Jardin du Carrousel section of the Tuileries Gardens in the 1st Arrondissement of Paris, when we took these high definition photos showing the statue called Montagne, which was sculpted by Aristide Maillol. 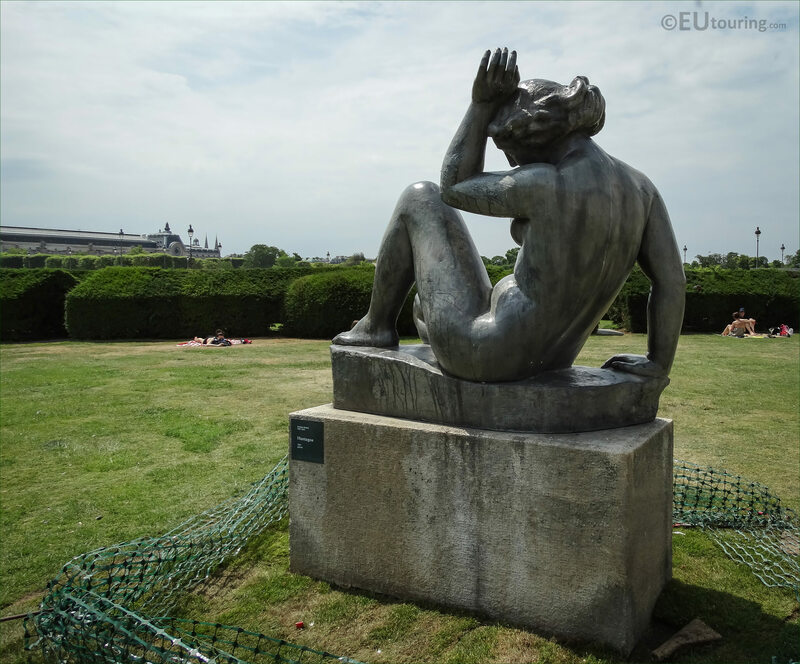 This first HD photo shows a statue called Montagne, which in English translates to Mountain, and is one of several statues dedicated to Aristide Maillol that were put in place within the Tuileries Gardens in 1964, and this is located in an area called the Jardin du Carrousel. 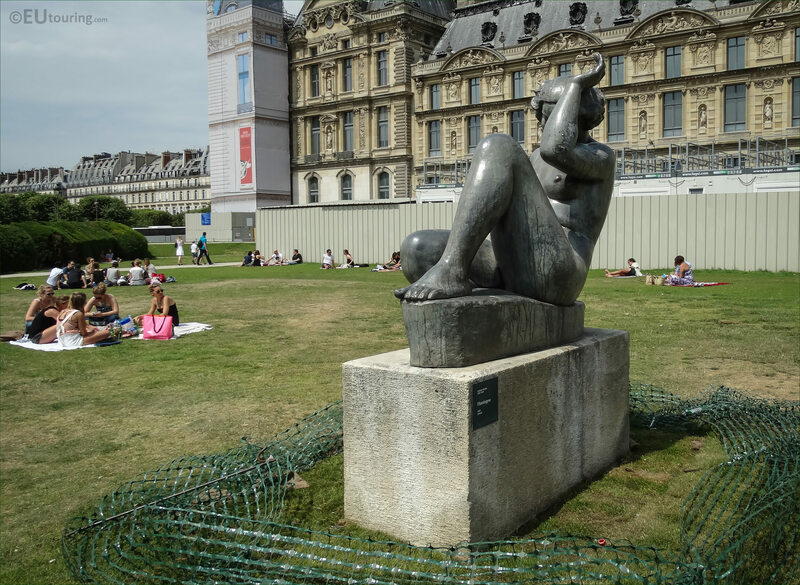 Now if you look closely at the base of the statue below the right leg, you will see that this has been inscribed with the name of the artist A Maillol, who was born in Banyuls in 1861, and died in the same area in 1944, but in a car accident and not through the tragic events of World War II. 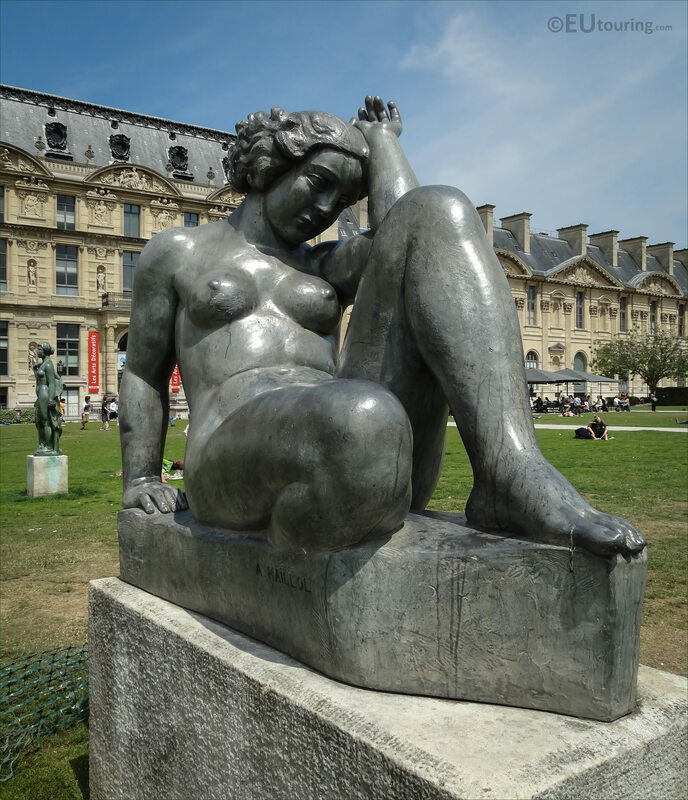 Aristide Maillol started out painting and even producing tapestry work, yet later in life became a French sculptor, with a passion for sculpting the female form, more often than not, naked, and the model for this particular statue was Dina Vierny. 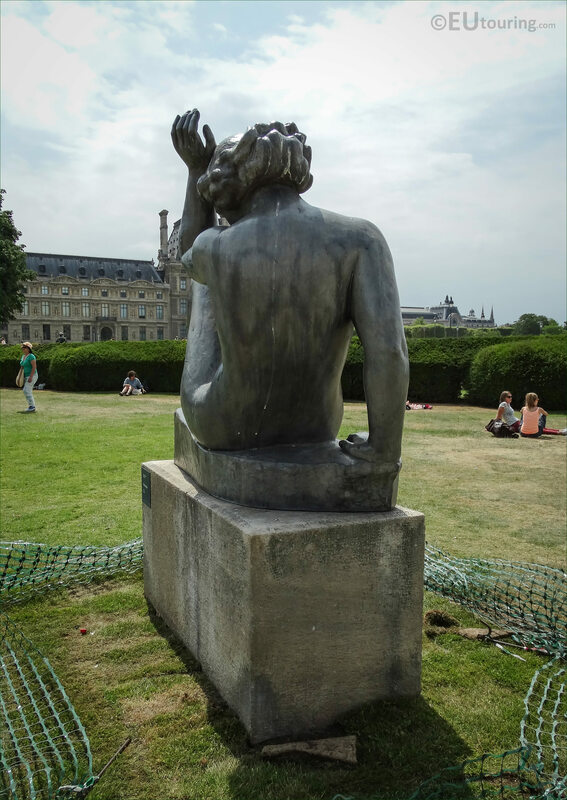 And this image shows a side view of the Montagne statue looking from the back, which was originally produced in plaster before being cast in lead and in the distance on the same lawn you can see another work by Aristide Maillol known as The Three Graces. 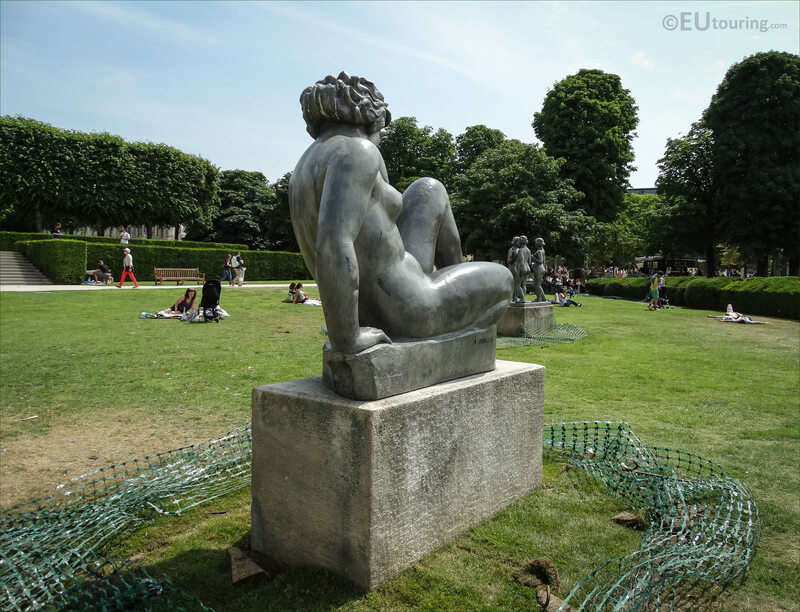 You will find that Aristide Maillol loved nature and during his career he often named his sculptures after specific elements such as Air and Mediterranean, and some of the plaster parts used to produce this Mountain statue were later used in another work called The River. 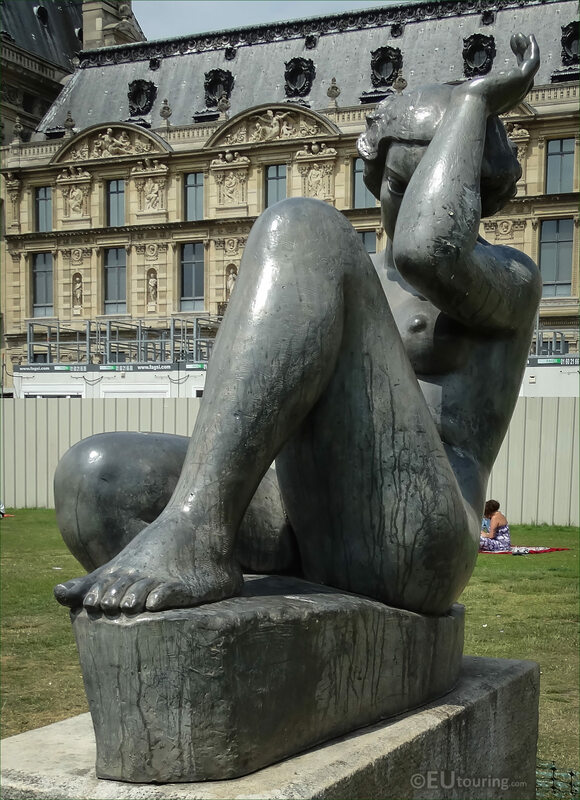 So when the artist was asked why she had her left hand up by her face, Aristide Maillol replied that it was to protect her from the wind, and in fact, Dina Vierny was actually a part of the French Resistance in World War II, helping people through the Pyrenees from where she resided with the artist, to the Spanish border. But Aristide Maillol strived to show the pure and smooth forms of his female figures, and although Dina Vierny was only his muse and model for the last ten years of his life, even his earlier works are exceedingly similar in their style depicting sensuality with a curvaceous figure, and it was Dina Vierny who donated Montagne and several other statues to the City of Paris. 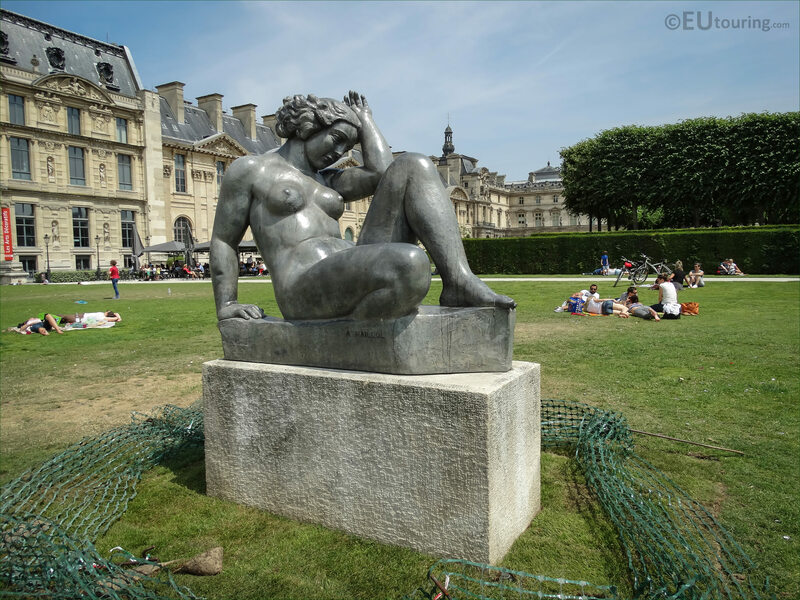 Having been an avid art collector herself, Dina Vierny wanted other people to be able to remember Aristide Maillol and appreciate his works, which is why the Mountain statue and several others were placed within this free public park next to one of the most famous tourist attractions in Paris. 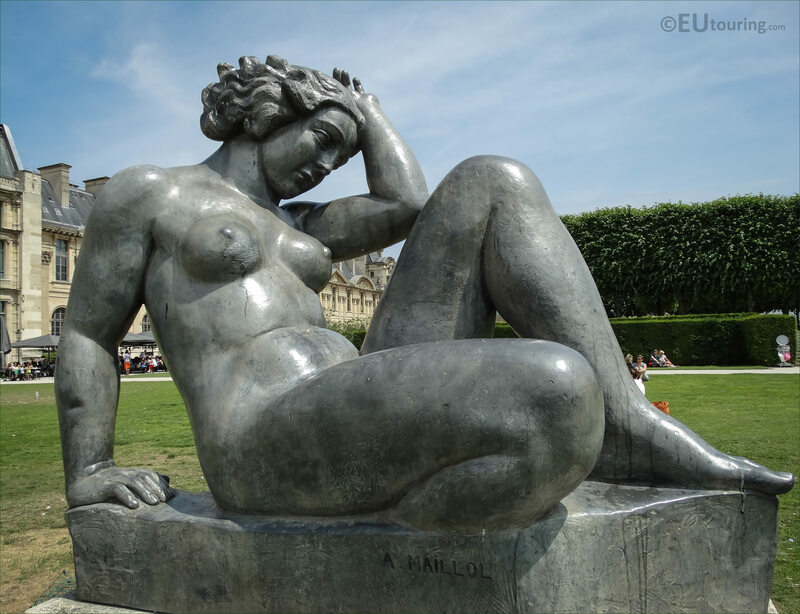 Yet she also opened a museum in Paris dedicated to this renowned artist who worked in the capital for several months each year, along with another in the former family home and workshop belonging to Aristide Maillol, which is located in Banyuls and is where he is buried, and this is one of the reasons that many of his statues and monuments are located in this area of France. 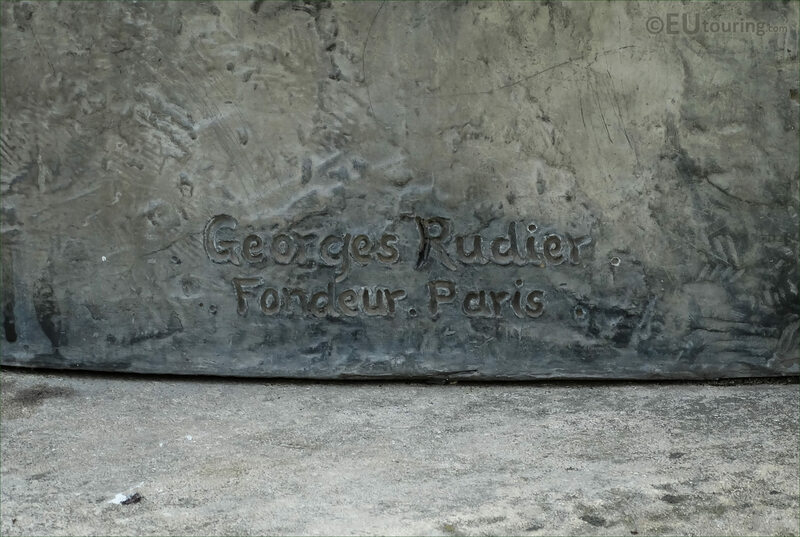 But this photograph shows a close up of where the foundry have inscribed their name onto the Mountain statue, which was cast in lead in 1937 by the Georges Rudier Fondeur company based in Paris, and the Rudier foundry has been recognised as one of the greatest for late 19th century and early 20th century art produced for French sculptors such as Auguste Rodin, Antoine Bourdelle and of course Aristide Maillol. 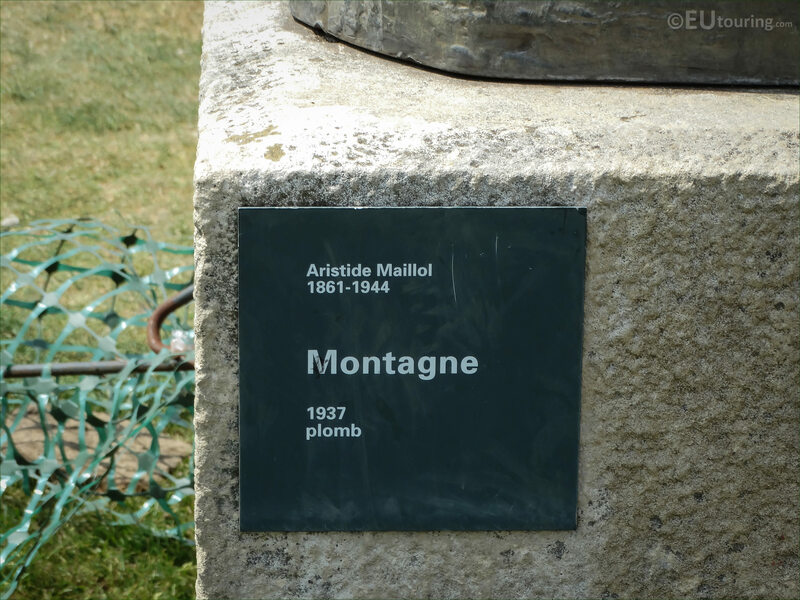 And in this last image you can see the plaque that has been placed on the stone pedestal that holds the Montagne statue by Aristide Maillol, and as well as the date of production, you can see the word Plomb, which is French for Lead, and along with bronze, lead was his other preferred material for presenting his sculptures.